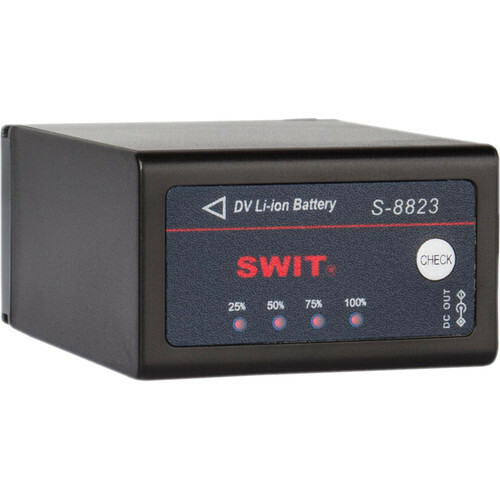 The S-8823 7.2V, 18Wh Lithium-Ion DV Battery with DC Output from SWIT is a replacement for the JVC BN-VF823 battery. It comes with a built-in 7.2V pole-tap DC output to power the camera and other on-camera devices simultaneously. The 4-level LED indicator gives you a quick view of the remaining power before using the battery. The battery can be charged using the SWIT AA-S3602V Dual Channel Charger. Alternatively, the battery can be charged via the pole-tap outlet using the SWIT S-3010D Portable Pole-Tap Charger. Box Dimensions (LxWxH) 3.4 x 2.4 x 1.7"
S-8823 7.2V, 18Wh Replacement Lithium-Ion DV Battery with DC Output for JVC BN-VF823 Battery is rated 3.0 out of 5 by 2. Rated 1 out of 5 by Meredith from Drains alarmingly fast This battery is very bad. I have been giving it bench tests with my JVC GY-HM170U. Even if I simply have the camera turned on, but not recording, not doing any zooms or anything, it drains at about twice the rate it's supposed to. In other words, when I put it on it reads 360 minutes. When I check it 40 minutes later, instead of reading 320 minutes left, it reads 280, as if 80 minutes have gone by. If I turn the camera off, take the battery off, and put it right back on, even if it was supposed to have 150 minutes left it drops down to 13-18 minutes left when I put it back on the camera. If I zoom, it drains the battery at MORE than 200% of the indicated rate. MAYBE, if you're shooting 2 hours solid it will work, but I wouldn't count on it. I will be returning this battery. Rated 5 out of 5 by Justin T. from Works fine with JVC GY-HM170U I read the negative reviews on the JVC BN-S8823 and was concerned about it not holding the charge it displays on the camera. So, I decided to buy this battery and I can confirm through bench testing that it doesn't have the same problems of running for about 15 minutes and then draining completely. It works like a champ and is a great alternative, now if only B&H will start listing this one with the HM170 instead of the JVC BN-S8823 that's caused so much disappointment.